We have been removing rubbish for Property Managers since 1985. There is nothing more frustrating than the appearance of a heap of discarded rubbish that mysteriously appears overnight. It blights your properties, adds to your work load, instigates phone calls from disgruntled residents and causes you extra frustration. Fly Tip, Bulk Rubbish, Junk are different names for the same problem, unwanted stuff left for someone else to clear up. Protech Property Solutions are the Estate Junk Removal Experts. We know that you want this problem dealt with correctly, professionally and promptly in line with legislation. We also know that you require us to work in adherence to your business processes, procedures and short time scales. You raise an order to us to remove the rubbish. Prevention rather than cure? Proactive rather that reactive? 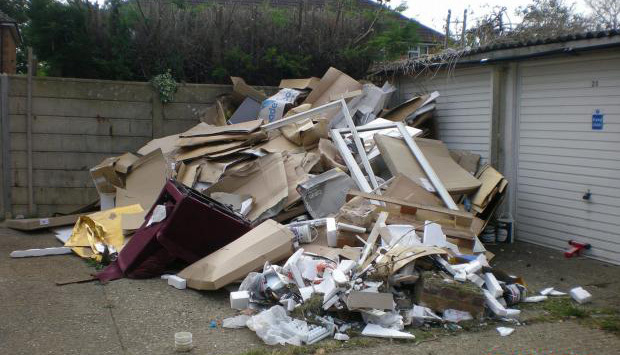 We understand that you would much rather stop occurrences of fly tip, bulk rubbish and junk dumping on your properties. Sample Sign Wording – Refuse collectors will not empty these bins if their access is blocked by sacks on the floor. Sample Sign Wording – Warning – CCTV and 24hr Enforcement Personnel are used in this area to monitor unauthorised dumping of rubbish. Blocked Fire Exits, Obstructed Stairwells. Obstructions left in communal areas are a hazard to everyone inside a building. The management of these areas is an ongoing problem for many Property Management and Housing Associations. Protech can provide a robust five stage management system which will ensure communal areas and fire exits are kept clear of obstruction and that Property Management and Housing Association are complying with Fire Safety legislation and TORTS The interference of Goods act. We have developed a set of procedures that when carried out competently will legally manage the problem of items left in communal areas whilst evidencing compliance with legislation and the landlord conditions of occupancy. We inspect communal areas for items left by residents or third parties without permission and/or contravening fire evacuation rules put in place by the landlord to comply with The Regulatory Reform (Fire Safety) Order (RRFSO) 2005 Article 14. Prices starting at £3.69 per property/scheme. If the owner/keeper requests return of the item in adherence to the conditions of removal we can arrange for them to collect the item. The owner must pay us the fee to release each item. A receipt will be provided. Charged to owner £50.00 per item (10% discount for multiple items). Stage 3 & 4 costs of £24 credited back to landlord. We donate reusable items to charities who assist local communities. For more information on our waste removal services please visit Protech Waste Solutions or call 0845 604 1288 and speak to one of our friendly team.